Adding Products: How do I set up my product’s Meta Tags? Meta Tags are elements of HTML coding that contain informational details about the page's content. Many search engines use this data to catalog web pages and return them as search results. This is part of the proper search engine optimization (SEO) process and can vastly improve your site's rankings in search engine results. By default, your 3dcart store will take the product's Name, Description and Keyword fields (specified in the Information Tab) and use these fields to create basic meta-tags for your product listings. However, you may want to manually configure your product's meta-tags and SEO parameters to have more control over how the products are cataloged. The product tab labeled "Meta Tags" is where this can be done. 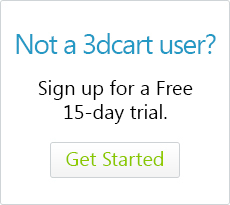 By default, your 3dcart store will take the product's name and use it in the page's title bar located at the top left of your browser window. However, if you'd like to specify your own title for the product, it can be done in this section. By default, your 3dcart will take the product's name (from the Information Tab) and apply it to the product's HTML page filename. However, since the file names on 3dcart are database driven, the filename will also contain catalog ID information. For example, a product with the name "T-Shirt-White" will generate a filename of T-Shirt-White_p_[catalog_id#].html. If you'd like a more practical name for your product's page, you can configure this in the "Custom File Name section. Furthermore, when specifying the custom page name, the page must have either an .htm or .html extension on it to work properly. Use this field to specify a 301 redirect for the product. This can be useful if the product's listing previously had very good SEO ranking but is now discontinued. Rather than sacrificing the previous ranking, the Redirect Link can be used to link the product's listing to a different item. Perhaps one that not discontinued or otherwise unavailable. As stated, your 3dcart store will take your product's description and keywords information and generate meta-tag keywords from these areas in the Information Tab. However, if you'd like to tailor your meta tags yourself, they may be placed in this section. These can be entered either manually, or by using the Tag Wizard if you are not comfortable with HTML coding.